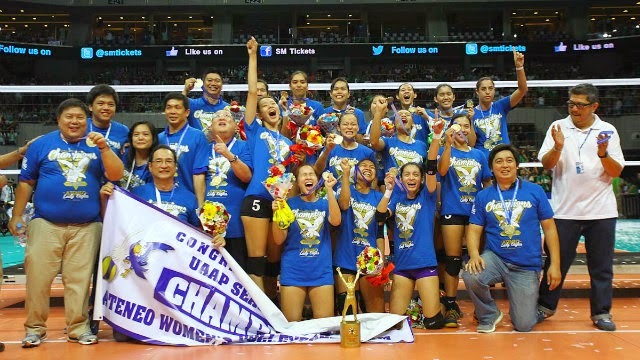 It's first time in UAAP history, Ateneo Lady Eagles hailed undefeated, 16-0 record. Back to back champions! Here's the full coverage of UAAP Season 77 Women's Volleyball The Finals. MANILA, Philippines – For the very first time in their school history, the Katipunan-based Ateneo De Manila University (ADMU) Lady Eagles victoriously defended their title and wrote their first ever back-to-back championships in UAAP history book by sweeping the De La Salle University (DLSU) in their best of three duel: three sets to none and sweeping the Season with 16 total wins on Saturday, March 14 at the Mall Of Asia Arena, in Pasay City. After a well-deserved 3-day break, Coach Asonorn “Tai” Bundit has finally mixed the proper formula for his team to completely close the season in a perfect and high note. It was déjà vu all over again for the Thai National Head Coach, shutting his archrival Coach Ramil De Jesus and his squad by blanking them again for the second time in the finals, 3 sets to none to bag his first ever back-to-back championships. Having two of his girls at the sick bay due to serious knee injuries, Coach Ramil De Jesus preached to his archers to make Ara Galang and Camille Cruz’s loss as an inspiration to give it all out and live another day. The Lady Spikers showed courage and heart and gave Ateneo a tough time in the first set. It was a seesaw battle all throughout the opening set. The ladies in green relied too much on their blocking prowess to improve their game 1 performance. DLSU Blocker, 5’10” Mary Joy Baron once again leaned on her towering height to reject digs and spikes from Ateneo front liners. Rookie Christine Soyud admitted that the pressure is on her to step in Ara Galang’s shoes. Soyud scored a handful in the first set and almost took it away from Ateneo. But the tournament’s Best Server, Best Scorer and MVP Allysa Valdez and her Co-Captain Amy Ahomiro surged for 6-0 run to close the first set 25-22. After a scary first set for Coach Tai and his girls and almost losing it due to service errors and blocked shots, they finally managed to score and hold the lead properly. Eagle-eyed Michelle Morente once again located the unmanned green turf several times for service aces. DLSU had Baron guard the net in the first, but her counterpart ADMU Rookie and Blocker Isabelle De Leon showed the crowed that they can score points from blocks too. The Lady Blue Spikers dominated the second set 25-17 and marched on to the final set of the season with bursting confidence. Captain Alyssa Valdez and her colleagues had the feeling that a do-or-die is now a mission impossible for their archrivals, they handled the third and final set very carefully and precisely. But despite of this, La Salle still managed to caught up and close the gap within just two in the final set. Julia Morado gave Ateneo its match point 25-23 and white confetti immediately fell and filled the entire and jam-packed Mall Of Arena with almost 20,710 fans in attendance. For the second time in the finals, the Multi-titled Alyssa Valdez bagged the Gatorade Player of the Game award with 20 points – 19 attacks and 1 block. But her Co-Captain, Kiwi Amy Ahomiro was declared the Season 77 Finals MVP. Closing the season with 16-0 is the longest winning streak in the UAAP history followed by their archrivals, De La Salle University Lady Spikers with 14-0 during the 76th Season which automatically qualified them to the finals but lost to the eventual back-to-back champions Ateneo De Manila University in the same season which they lost their title.